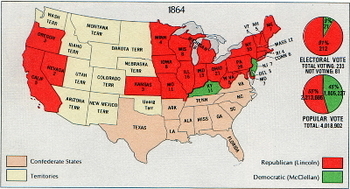 1 In 1864, it was time for another presidential election. No one had won a second term since Andrew Jackson. That had been more than thirty years ago. And it didn't look like Abraham Lincoln would change that. 2 The Union had suffered a lot of losses during the Civil War. These losses had cost many soldiers their lives. There had been chances to end the war early. For many different reasons, these chances had been lost. People blamed Lincoln for these failures. The public was worried that Lincoln would not be able to win the war. 3 Lincoln almost lost the nomination for the job. His political party was very worried that he would lose. They talked about other men that could run for the job. Most of these men decided they did not want the job. Instead, Lincoln won the nomination. 4 The party wanted to give Lincoln a better chance at winning. They picked Andrew Johnson to run for vice president. He was from Tennessee. This would help win some votes from people that lived in the South.